INTERVIEW: Reactions with MRCH from Phoenix! MRCH is releasing their debut album Reactions on October 12. The duo consists of Mickey Pangburn (Vocalist/Guitarist/Synth), and drummer Jesse Pangburn. Many of their songs have been featured in television shows, such as The Vampire Diaries and Famous in Love. To celebrate the release of their album, the duo is having an album release show (also their first headline show) at Valley Bar on October 14. Come and party with the indie electronic duo! Tell us about your band name, MRCH… How did you come up with it? Does it have any special meaning? It’s pronounced like ‘march’. When people march, they have purpose. When people march together, they have a common goal. They step together. We wanted a name that showed we were in music for the long haul. For better or for worse, on the same page. We dropped the “A” because people kept coming across ‘marching bands’ when they’d do a google search of us! What did you most enjoy about the process of making your new album, Reactions? The playing. We had no one to answer to, so we could just try out whatever we wanted. The hardest part is calling something ‘done’… We’re already writing more though, so it’s become a vicious cycle. When you aren’t making music or performing, what do you both enjoy doing in your free time? Jesse likes eating street tacos. I like hanging with my cats. 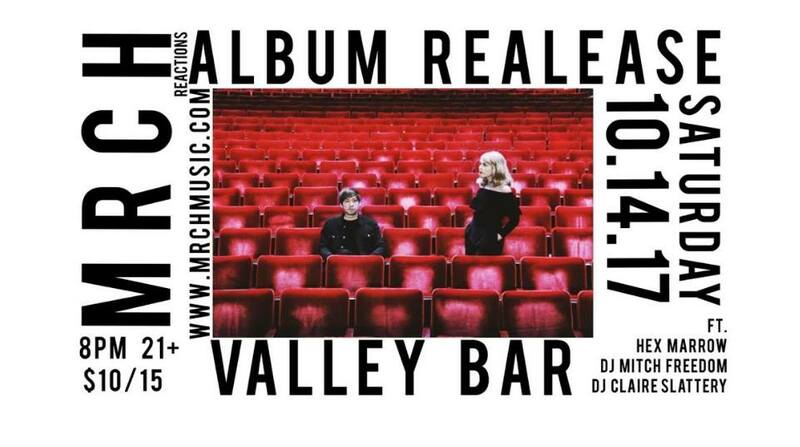 Are there any plans for MRCH to embark on a tour following the album release party at Valley Bar on October 14? LA is next up. Details coming soon on that. Then, yes – touring! We probably shouldn’t hold our breath for Bleachers to invite us along with them… So, we’ll be booking DIY. Dates coming soon, hopefully up through the spring. Have either of you toured before? Do you know or speak any other languages? We wish… I like to dream of being fluent in French. MRCH formed in 2015, and the two of you were previously members of a local band named The Prowling Kind. What was the motivation to go from a five piece band, to a duo? Scheduling and goals. It’s hard to wrangle 5 different people/opinions/lives – into sharing a common goal and agreeing on a means of reaching said goal. We kinda had to re-set, so everyone could do what was best for them. MRCH is a totally different animal than TPK musically speaking too. Did your previous experience in the local music scene boost your success in MRCH, or did it feel like a clean slate? We felt like we learned so much playing with TPK. Jesse and I went to school for music, but felt like Prowling Kind was kind of like an internship. We booked our first tours, got introduced to the local scene, dealt with the business side of things. So there was a lot we were grateful for from that season. However, MRCH is so different in both sound and vibe that the crossover was minimal. We never made it a goal to ‘take’ Prowling Kind fans. We hoped they’d like MRCH too, but it was a mixed bag of responses. MRCH really felt like starting over. It felt like a clean slate. Have the Phoenix music and art communities influenced your music and image? The Phoenix music scene has been really supportive. The thing we appreciate most about it, is really how little they influence our sound or image. There’s such an eclectic and diverse spectrum of artists, we don’t feel inclined to be much like anybody else. We never feel like we’re expected to fit in a particularly Phoenix mold. There’s room to explore here. There’s a lot of freedom. There are a bunch, but some are : PAO, Bogan Via, Harper and the Moths,The Technicolors, The Darts, Hex Marrow & House of Stairs. How has the exposure of your songs on multiple television series helped promote your music? We’re so excited to be playing. Especially this release show! It’s our very first time headlining and we’re working hard to make it extra special. Do you have a message for your fans coming to the release show?